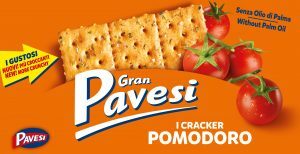 Gran Pavesi al Pomodoro e Formaggio are crackers that combine the simplest of Mediterranean flavours: tomatoes, Parmesan cheese, extra virgin olive oil. To make your day even better with a touch of tasty pleasure, wherever and whenever you want. 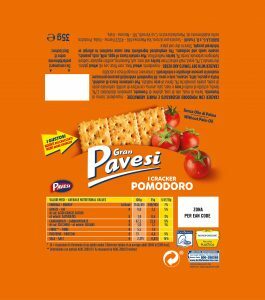 INGREDIENTS: Wheat flour, tomato semi-concentrate 20.1%, soybean oil, extra virgin olive oil 2.9%, salt, Grana Padano PDO 1.7% (milk,egg lysozyme), acidity regulator: sodium bicarbonate, maltbarley flour, oregano 0.5%, aroma, yeast.May contain traces of peanuts, nuts, sesame seeds and soya. 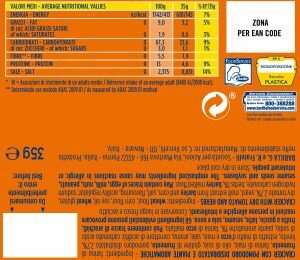 The ingredients in bold may cause a reaction in people with allergies or intolerances. May contain traces of nuts, sesame seeds and soya.